As originally published by Quickread, September 2014. A special appreciation to those whose thoughts and ideas are part of this missive, and have made the distinction between restricted stock and blockage. Their similarities are primarily ones of a holding period before a sale, at an optimal price. "an amount or percentage deducted from the current market price of a publicly traded stock to reflect the decrease in the per share value of a block of stock that is of a size that could not be sold in a reasonable period of time given normal trading volume." This definition may necessitate an investor concession as was found in Montclair Trust Co. v. Zink, Prerog., N.J. Eq. 401, 57 A.2d 372, 376, 380. It also may raise the issue of the number of investors who could or would purchase the aggregate block and wish to mitigate risk by maintaining a diversified portfolio of holdings. Therefore, the average amount of individual securities traded over a specified period of time would be considered. Trading activity relates to the liquidity of a security. When average trading volume is high, the stock can be easily traded and has high liquidity. As a result, average trading volume can have an impact on the price of the security. If trading volume isn't very high, the security will tend to be less expensive because people are less willing to buy it. Volume typically increases as price increases, and vice versa. Effectively, this is a fundamental supply and demand issue. When too great a concentration of goods/services exceeds demand, it creates a downward pressure on value placed upon such goods/services. However, the burden is upon the taxpayer to demonstrate the existence and amount of the likely concession as found in Safe Deposit and Trust Co. v. Commissioner, 35 B.T.A. 259 (1937). In certain exceptional cases, the size of the block of stock to be valued in relation to the number of shares changing hands in sales may be relevant in determining whether selling prices reflect the fair market value of the block of stock to be valued. If the executor can show that the block of stock to be valued is so large in relation to the actual sales on the existing market that it could not be liquidated in a reasonable time without depressing the market, the price at which the block could be sold as such outside the usual market, as through an underwriter, may be a more accurate indication of value than market quotations. In addition, this section of the regulations permits consideration of the option of using an underwriter to sell the block, if doing so outside the usual market provides a more accurate indication of value. If this is the case, the reasonable costs to liquidate the stock to include due diligence and professional fees may need to be considered. The fair market value of shares of a publicly traded corporation is ordinarily deemed to be the mean between the highest and lowest quoted selling prices on the valuation date; Treas. Reg. section 20.2031-2(b)(1). However, the stock may have a different fair market value if the number of shares held are substantially different from the shares being traded on the open market. In the tax court case of Estate of Auker, "blockage" is the recognition in the field of taxation of the fact that in some instances, a large block of stock cannot be marketed and turned into cash as readily as a few shares. This is because an immediate sale of the investment would influence the "bid-ask" spread by lowering liquidation proceeds. Tax courts have recognized blockage discounts in a handful of cases, such as Estate of Friedberg v. Commissioner, Estate of Davis v. Commissioner and Estate of Foote v. Commissioner. Relative size of the block to "dribble out"
If these factors are assessed, and it is determined that the block is substantial enough that it cannot be sold in a short time period without depressing the market price, then a blockage discount is present. In this case, the most practical course of action might be a gradual disposition of the block. There scenario also includes several other possible conundrums. The first is that the actual number of shares traded is not a single share at a time. Blocks are commonly 100 shares or greater. Therefore, if 10,000 shares are traded in a day and there were an equal number of trades of 100 shares, then there would have been 10,000/100 or 100 trades, with a trade equaling a transaction between one seller and one buyer. However, if the typical number of shares traded as a block was 1,000 shares, the number of trades would be only 10. Another factor is one sale of 100 shares where the seller's desire to liquidate may create the lowest sale price of the day and one buyer wishing to buy 100 shares, which in turn may create the highest sale price of the day. Neither may be truly reflective of the "typical" transactions occurring during the specified period in price or number of shares. Therefore, if the block size to be sold is 5,000 shares and no such transaction has occurred during the reviewed trading periods, it may be rightly argued that there is no basis for such a transaction. So, the issue is not solely the daily volume, but also the typical blocks of shares bought and sold during any given period. While not all-inclusive, another issue could be argued of relative or optimal benefit. Would the notional investor seek to sell his/her interest/shares at prices below that of its value as of the date of value? If the shares were conversely showing a steady upward trend, would holding the shares make more sense? The assumption under date of value is that the sale must take place to optimize the economic benefit. This also suggests the sole option is one to liquidate the holdings in terms of cash within a "reasonable" time. The concept of optimization suggests a skilled investor/broker, not a "typical" retail investor who would not concentrate risk within a single holding. Equally, an assumed forced sale of a large block would tend to contradict the notion of fair market value, which for equities, seldom provides an assumed holding period. While dribbling out the block shares mitigates the risk of a large price decrease from flooding the market with additional shares in an immediate sale, the owner is now subject to a prolonged holding period and risk of a price decline for reasons other than incremental trading volume. Numerous published studies (e.g., restricted stock studies) prove that investors require discounts to purchase investments with long holding periods. Stocks develop normal ranges of trading volume and the sale of a block of shares represents incremental volume over and above these established trading levels. Price volatility and recent stock price trends also impact the magnitude of a blockage discount. If a lengthy holding period is probable, stocks that have historically exhibited significant price volatility bear more risk of a price decrease before disposition of the block is completed. A gradual sale is of greater concern when a stock price is declining than if the stock is appreciating. Blockage discounts will generally be lower on dividend-paying stocks than stocks that lack a regular dividend. Dividends represent a current return on investment during the holding period of a block, and the presence of a dividend partially mitigates the exclusive dependence on the proceeds from the gradual sale of the block. Legal restrictions may impact an owner's ability to liquidate a large block of shares. If a block is held by a company executive, director, or substantial shareholder, then the owner may be deemed to have "affiliate" status and must sell the block pursuant to Securities and Exchange Commission Rule (SEC) 144 whereby a resale plan may require approval in order to be compliant with insider trading policies of the corporation, which may further constrain when sales are permitted. Rule 144 requires that a minimum holding period (for restricted stock) and other conditions, including a trading volume formula, be met to sell shares in the open market. After the minimum holding period, if any, has been met, affiliates may not sell more shares of stock during any three-month period than the greater of: a) 1% of the outstanding shares of the same class being held or b) the average reported weekly trading volume during the four weeks preceding the sale. During recent periods of reduced trading volume, the first, rather than the second, prong of the Rule 144 volume limitation may set the maximum number of shares permitted to be sold. If the block is subject to sale restrictions under Rule 144, the holding period and associated blockage discount may be significantly greater than if the block were able to be liquidated in accordance with normal market trading volume. 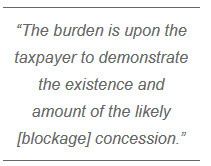 Courts frown upon using blockage discounts applied in earlier court decisions. Instead, as in Estate of Foote, courts typically prefer experts to determine each discount independently of legal precedent. Tax court denied an average of 18 court case decisions regarding discount for blockage discount. Judge found no persuasive evidence to rely on the restricted stock and pre-IPO studies, but allowed a 20 percent blockage discount. Allowed one of the largest blockage discounts of 25 percent to large blocks of Frederick's ofHollywood stock, which was thinly traded. Estate of Georgina Gimbel v. Commissioner, T.C. Memo 2006- 270 (December 16, 2006). The Tax Court decided that 14.2 percent was the appropriate overall discount for blockage and for the restrictions on the immediate marketability of the subject shares. The first method of estimating the size of the blockage discount is the "estimation of the present value of cash flows" arising from the sale of small lots in the stock over a reasonable period of time. The estimation is based on (a) the number of shares the market could reasonably absorb and sustain and (b) a required rate of return to the shareholder over the "dribble-out" period to compensate for the risk of not receiving an amount equal to the current share price over the period. This dribble-out period should be the shortest amount of time necessary to liquidate the block without depressing the share price. In order to estimate the dribble-out period, market makers in the subject stock should be interviewed and historical trading activity analyzed. These findings will assist in determining what the typical or average trading volume has been over a relevant historical period, and what additional shares the market could absorb in scheduled periods without affecting the stock's supply/demand price equilibrium. market exposure, the cost associated with bearing the risk of holding a position in the marketplace without the ability to close the position for a specified period of time. The appropriate blockage discount is the combination of price pressure and market exposure that produces the least cost to the seller of the block. The third method, the "portfolio insurance" approach, involves a "protective put," which is the combination of a share of stock with a put option on the same stock. For years, portfolio managers have utilized protective puts to insure their portfolios against losses and thus reduce the risk to their portfolios. Protective puts make it possible to create a fully hedged position for the subject interest using a series of put options. Once the number of additional shares that the market can absorb above normal or average period volume has been determined, the holder theoretically needs only to purchase a series of put options with a strike price equal to that of the current stock price. This includes maturities equal to the subject periods required to liquidate the position in an orderly fashion without disrupting the stock's supply/demand equilibrium. While not all-inclusive, the blockage discount provides another arrow in the analyst's quiver, and may offer significant tax savings if supported with sound factual data.